Download one of our helpful ORDERING GUIDES: I offer two types of downloadable guides: one that you can fill out electronically (with Microsoft Word) and e-mail back to me at bob@hatsoffhair.com and one that you can print out and MAIL back to me. CLICK HERE to view and download these guides! Note how the French and Extra-Fine Swiss virtually disappear when pressed flush against the skin. French Lace: For most people, especially new wearers, French Lace is your best choice. It is durable and quite invisible against skin. Also known as #64 lace, this is the base material I use personally. Extra-Fine Swiss Lace: Extra-Fine Swiss Lace is even more invisible than French Lace, but it is also more delicate and requires a bit more care. 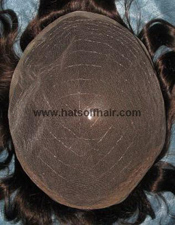 This is the best lace for an undetectable hairline, however, the newest version of our French lace is so similar to the Swiss, that most people still choose the French lace, even for an exposed hairline..
0.12 Monofilament is a good base choice for a higher-density system. It is stiffer than lace and holds its shape very well. 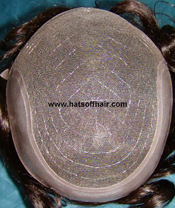 You cannot use Mono for an exposed hairline, but you can add a lace front onto a Mono base. When you place it against your own skin, thin skin is invisible and virtually undetectable to touch. 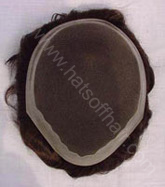 When attached, it feels extremely secure and seems to vacuum-seal itself to your scalp. 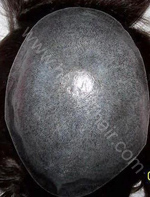 This is the same material that other companies refer to as a “Non-Surgical Hair Graft” or a “Dermal Graft” in order to justify their high prices. 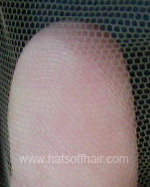 Choosing injected hair or knotted hair for Thin Skin bases. Injected hair is hand-inserted into the skin base with a tool that is designed to inject the hairs at specific angles, duplicating the natural growth pattern of human hair. Injected hair has no knots and gives a very natural and uniform appearance. The hair tends to lie close to the scalp. It can be difficult to style because the hairs are sealed into the base at fixed angles. My factory uses a new type of knot that is almost invisible for a great appearance. The knotted hair has more “height” or “lift” than injected hair. New ThinSkin base colors now available! If you want one of the alternate colors, be sure to indicate your choice under "Special Instructions" on your order form. What is the best all-around base type? For veteran hair wearers, an all-lace base is the "king of the hill" because it is not only undetectable in almost any situation, but it is also the lightest and coolest of all base materials. 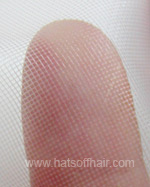 For newcomers, I recommend a French lace base with a narrow perimeter of poly around the back and sides only. 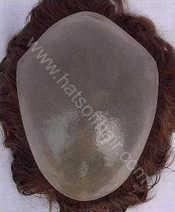 This combination allows you to show your hairline and also provides easy attachment and removal.